In this blog, I have focused a lot on the challenges that Red Hook has faced in the past, and is continuing to face - from cruise ship and container ship pollution, poor planning - both with development and transportation - continuing and increasing congestion and pollution from trucks, and, the most recent affront to our neighborhood's quality of life (sadly, courtesy of the New York City Economic Development Corporation ... again! ), tourist helicopter noise. There will be more on all of these subjects in subsequent posts - oh, you bet there will! 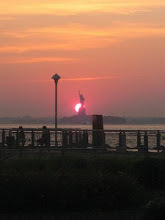 - but I also wanted to remind myself, and anyone reading this blog, why this place - Red Hook - is so worth fighting for. 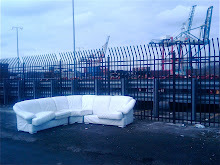 In this post I'd like to just touch on a few unique Red Hook institutions that enrich our community and give a lot of joy to our residents and many who come to our waterfront neighborhood to enjoy themselves. 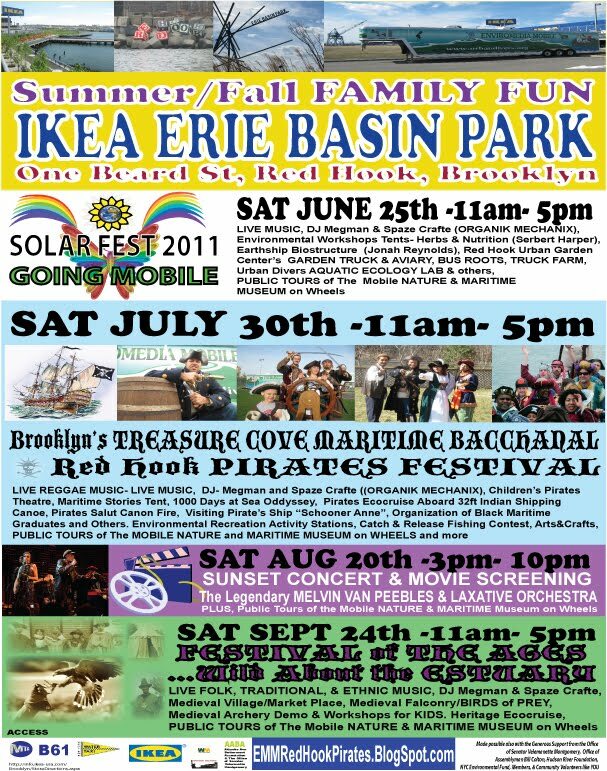 They have programs throughout the summer that I'm sure will draw many patrons - both from Red Hook and the city beyond. SHOWBOAT SHAZZAM - 2011 Shows: June 5th, 19th, 26th and July 24th. The first time I came to Red Hook, over a decade ago, before moving here (which my family and I did shortly afterwards), I came to take my family to see "CIRCUSundays", the amazing mini-Circus that David Sharps has been hosting on the Lehigh Valley No. 79, a historic barge that he literally dragged out of the mud years before and lovingly restored and reincarnated as the "Waterfront Museum". 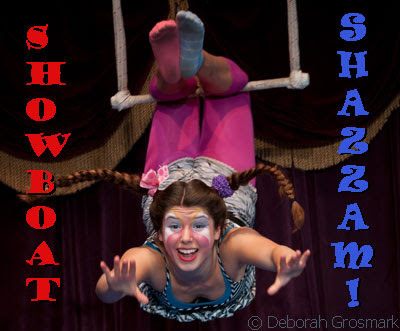 That wonderful program continues this year in its 15th season under its recently updated name, "Showboat Shazzam", and, in that tradition, the shows (two daily - 1pm and 4pm) will be held on the barge on three Sundays in June (5th, 19th, 26th) in Red Hook at the Waterfront Museum's permanent home pier on Conover Street (right next to the Fairway overflow parking lot). Additionally, in an effort to expose this wonderful experience to even more New Yorkers, between July 14th and July 26th the barge will temporarily relocate to Pier 6, Brooklyn Bridge Park, at the bottom of Atlantic Avenue, and "Showboat Shazzam" will take place on the barge at that location on July 24th. Please check out the "Showboat Shazzam" schedule and buy tickets here. 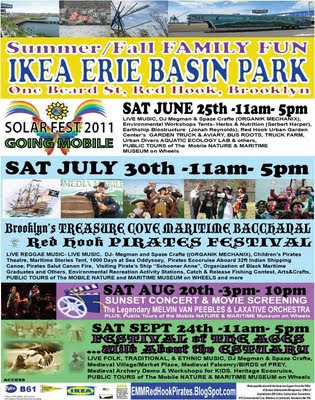 The barge will also be visiting other city neighborhoods throughout the summer including Riverdale and Hudson River Park. Check the Waterfront Museum site for details. This unique Red Hook experience is not to be missed - for young and old alike! ENVIROMEDIA MOBILE MUSEUM - Summer and Fall Series - First Event, Sat June 25th - "SOLAR FEST 2011"
The Urban Divers and their Director, Ludger Balan, have created a mobile museum they call the "Enviromedia Mobile". Essentially this is a huge trailer - a mobile museum on wheels - that is parked at the Erie Basin Waterfront Park (part of the IKEA site) and from there they bring a series of exciting children and families programs. You may have caught Ludger's educational events - sometimes about falconry, the ecology of our estuaries - including New York Harbor - and other environmental issues. The Urban Divers' mission is to provide "quality and innovative public engagement programs in Environmental Literacy and Maritime Cultural Enrichment". Ludger and his organization are passionate advocates for these causes, and the Summer and Fall events at the Enviromedia Museum will expand on these themes and - most excitingly - incorporate music in events including the "Solar Fest 2011" (Saturday, June 25th), a "Pirate Festival" (Saturday, July 30th), and "Sunset Concert and Movies" (Saturday August 20th) and as well as tours of the museum, "Truck Farm" and much, much more. LIVE ACOUSTIC MUSIC CONCERTS , VARIOUS ENVIRONMENTAL RECREATION STATIONS distributed throughout the Waterfront Park, PUBLIC TOURS of The MOBILE MUSEUM, The MOBILE MUSEUM GIFT SHOP, RELAXATION and REFRESHMENTS. Here is a flier with all the upcoming events (click to enlarge). You can get there via the IKEA Water Taxi. 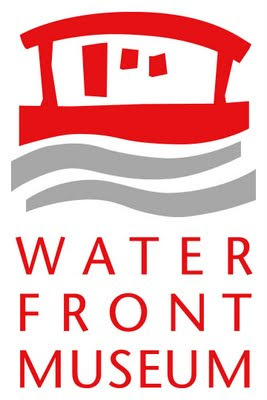 Check out some of the great things coming to our waterfront! Carolina Salguero's excellent organization, PortSide New York, has been creating programs on the Red Hook waterfront for many years. Activities mostly center on PortSide's ship, the Mary A. Whalen, a re-purposed oil tanker, on which PortSide has held a wide variety of events - from "Tanker Opera", to the "Roots and Ruckus" festival (in collaboration with the Jalopy Theatre), tours, waterfront education, community outreach and other cultural activities. PortSide also hosted the excellent "Dutch Flat Bottomed Boats" event at the Atlantic Basin, and co-ordinated events over the last year or so that brought tall ships such as the "Gazella", "Clipper City", and historic tug "Pegasus", that drew hundreds to Red Hook's waterfront and gave us all a first hand glimpse of the wonderful waterfront that is mostly inaccessible to our residents. PortSide's future permanent home in the Atlantic Basin, the unique and historic harbor nestled between Red Hook's residential blocks and the Brooklyn Cruise Terminal, their creation of a "cultural center" and headquarters in a part of the adjacent Pier 11 shed (the major part is used by Phoenix Beverages for garbage and recycling), and use of 600 feet of water frontage is going to give them an opportunity to hold more of these events and share the waterfront with more of our neighborhood's and city's residents. Our plans for Atlantic Basin include direct service to the working waterfront; visiting vessels (from tugs to tall ships); more H2O arts, cultural tourism products and harbor advocacy; youth programs, a marine career center; and a maritime interpretive center—programs for diverse economic groups and individuals. In 2011, PortSide plans for this space, and our vision in general, were affirmed in New York City’s new comprehensive waterfront plan, Vision 2020. I don't have any specifics on PortSide's planned activities over the Summer, but check their web site, here, for information and below is a snippet from their most recent email news letter (subscribe via Constant Contact here). This summer PortSide can employ five youth from Brooklyn public housing to complete the restoration of the Captain's cabin through NYC's Summer Youth Employment Program (SYEP). Below, see how to help us offer this program or go straight to the fundraiser page here. To learn more about the restoration work click here. 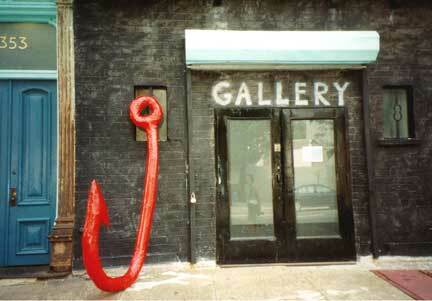 The Kentler International Drawing Space, has been open in Red Hook since 1990. It's director, Florence Neal, has created a focus for artists in Red Hook, as well as reaching out to the community through educational events and programs such as K.I.D.S. Art Education. The gallery sponsors monthly and bi-monthly exhibitions featuring solo, group shows and installations by some of New York's most exciting emerging and under-recognized artists. Shows drawn from the international community have given traveling artists an opportunity to visit America and bring their work to a New York audience. The gallery is open to the public Thursday, Friday, Saturday and Sunday from 12 - 5pm. Kentler is holding a K.I.D.S. event on Saturday, June 4th, at Valentino Pier as part of the "Red Hook Fest" waterfront arts festival. This festival is presented by "Dance Theatre Etcetera", another excellent Red Hook organization. Kentler International Drawing Space and K.I.D.S. Art Education invite children and their adults to discover new ways of drawing through the art of knot making (sailor knots! Boat mooring knots! Silly invent-your-own knots!). Teaching artist MEGHAN KEANE invites participants to join her in making a giant growing 3D drawing out of knots and other ways of connecting recycled materials together! Materials will include cut plastic bags and other linear delights. There are many other organizations and institutions I could mention - many other reasons to love Red Hook - from the excellent and unique stores, businesses, bars and venues (hello Sunny's! ), restaurants, Latin American food vendors, Valentino Pier (minus helicopters), Coffee Park (even without our much-missed gardener, John), incredible neighbors, sense of community and so much more, but I actually have a whole other life outside of blogging ... you know, being a dad, husband, playing and teaching music, and all of that. So, that will have to do for now (my son needs to be fed!). I hope this short list gives you some reason to feel good about living in, or even visiting Red Hook. As we battle the things that attack our quality of life in Red Hook and beyond, it's good to know that these wonderful experiences are right here - in our neighborhood - on our waterfront and within our community. So get out there .... and enjoy!